FORT BELVOIR, Va., Oct. 25, 2011 -- Northrop Grumman Corporation (NYSE:NOC) employees from across the Washington D.C. area joined with United Service Organizations (USO) members to assemble over 7,000care packages for deploying servicemen and women. On Oct. 22, nearly 200 Northrop Grumman employees and their family members and friends volunteered at an Operation USO Care Package 'stuffing party' at Fort Belvoir, Va. Together, they filled two-gallon, zip-lock plastic bags with items requested by our military, including international calling cards, toiletries and entertainment items, to create care packages that will be given to service members as they deploy to duty locations around the world. 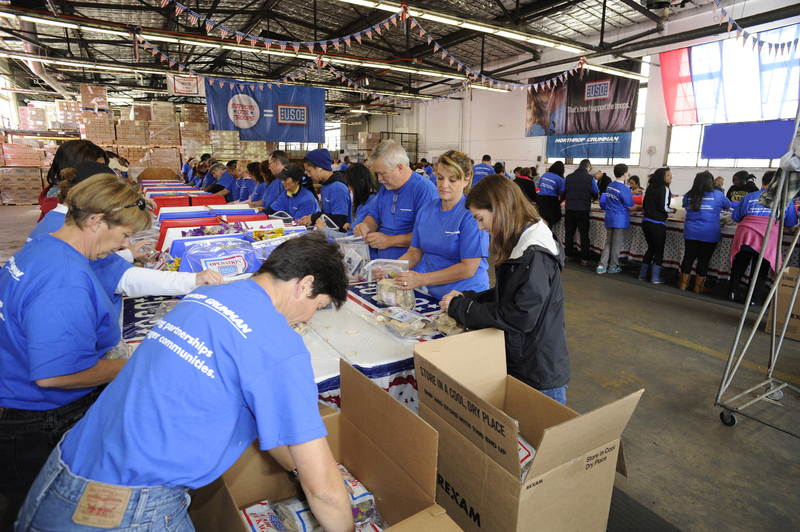 "The enthusiastic, dedicated group of volunteers here today reached a milestone in Northrop Grumman's support to this incredibly important program over the past eight years: We filled our 300,000th care package," said John R. Landon, corporate vice president, Northrop Grumman Corporation. "While we may tally our contribution in numbers, every volunteer has told me how personally meaningful and gratifying the time they've spent here today has been. It is an opportunity to reach out and touch someone who is sacrificing far more of his or her time for all of us." "Northrop Grumman contributes its talents and technology to the success of our troops through a host of critical programs. These gifts of our time – the contributions of our volunteers to provide these 'touches of home' – make a tremendous difference to the personal welfare of our courageous men and women serving in harm's way," said Joe G. Taylor, Jr., vice president for ground combat systems, Northrop Grumman Information Systems. Taylor, a retired Army major general, is the executive sponsor of Northrop Grumman's Veterans, Employees and Reservists Inspired to Act & Support employee resource group. Northrop Grumman is a strong supporter of the USO. The company contributed to the start-up of the Operation USO Care Package program in 2003 and hosts numerous stuffing parties every year. The company also sponsors a number of local USO programs around the country, including the USO Airport Lounge for military travelers at Washington Dulles International Airport. Since 2010, Northrop Grumman has been the corporate sponsor for the Military Bowl presented by Northrop Grumman for the benefit of the USO. This year's game is expected to feature the U.S. Naval Academy (if bowl eligible) against an Atlantic Coast Conference team and will be held on Dec. 28, 2011, at 4:30 p.m. ET at RFK Stadium in Washington, D.C. The Military Bowl seeks to generate broad support for the USO, positively impact the regional economy, and honor the U.S. military and their families.